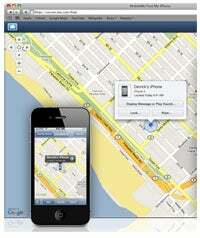 Apple introduced on Friday a free iPhone and iPad app that lets you locate a lost or stolen iPhone, at a cost -- you will need to have an Apple MobileMe subscription that runs at $99 per year. Called Find My iPhone, the Apple app works with iPhone, iPad, and iPod Touch devices, and can locate any of these using the built-in GPS chips, or Wi-Fi (in the case of the iPod Touch). Find My iPhone is actually the app version of the same service Apple offers to current MobileMe subscribers via a Web browser. The app can be downloaded for free from the App Store, and can be used from a different Apple mobile device when you lose yours. The browser-based version is still available at the MobileMe website. The app produces a map with the exact location of the lost or stolen iPhone, and you can lock it remotely with a passcode. You can also wipe the missing iPhone remotely, or display a message (with sound) on the device's screen with information on how to return it. There is no need to install additional software on an iPhone in order to be able to locate it with Find My iPhone when misplaced. You just need a MobileMe account configured on the lost phone, with the feature enabled from the Settings menu. But this has a drawback as well, as you have to switch on the Push setting for your MobileMe account (which consumes more battery) in order to take advantage of Find My iPhone. The new iPhone app comes as part of a revamped MobileMe service offering from Apple, which was introduced on Friday as well. MobileMe is a Web-based service that wirelessly syncs e-mail, contacts, and calendar events between iPhones, iPads, Macs, and PCs. It also offers 20GB remote storage on Apple's servers, which is shared with your e-mail inbox. There are really no viable alternatives to the Find My iPhone service and app from Apple. Several apps in the App Store claim to have similar functionality, but they are very limited in what they can do (a thief has to open an app that would identify the phone's location and send it to you) or they require a jailbroken iPhone. As for cheaper alternatives to MobileMe itself, you can always replace it with Google alternatives (Gmail for e-mail, Google Calendar for calendar syncing, and Dropbox for remote storage), but you will lack the integration of these apps (which Apple is charging $99 per year) and the Find My iPhone feature.